Serum, oh serum. I’ve sung the praises of serum many a time on this blog. But that’s because there’s just so many ridiculously good ones! iS Clinical is a brand whose scientifically-advanced, botanically-based ingredients work to improve practically any major skin concern. 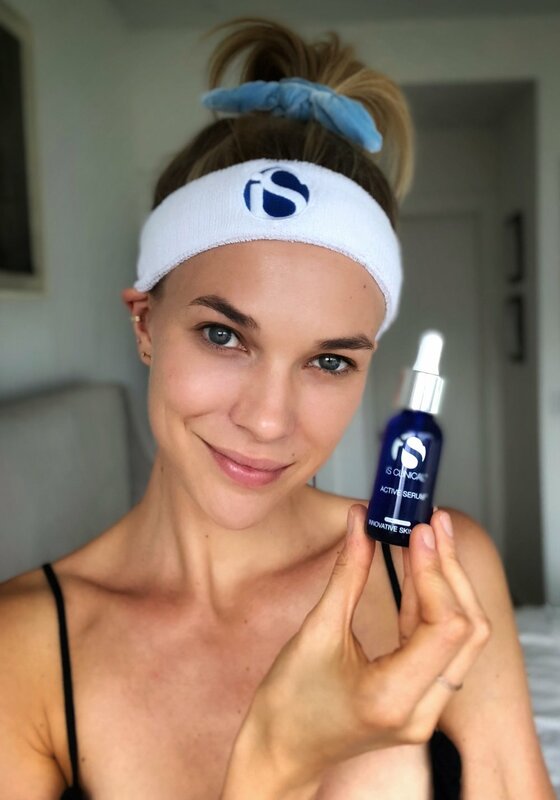 Their multi-tasking formulas are great for all skin types and ages, and promote cellular regeneration, as well as a brighter, clearer complexion! Many skincare experts choose iS Clinical for their clients, and I now see why. This stuff is totally legit- I’ve already noticed some pretty dramatic results! In the mornings, I’ve been reaching for the Pro-Heal Serum Advance. This one is a vitamin C-based serum, and great for that extra UV protection. Its healing and reparative properties come thanks to some powerful antioxidants, yet I’ve found this product to be gentle enough for sensitive or irritated skin! The Active Serum is their most popular product, and after seeing how quickly you get results, I totally understand why. It has many anti-aging, anti-blemish, and brightening benefits, and really works to smooth and soften your skin. I like to use this serum at night before bed, and I love the cool, tingling sensation it causes as applied. Whenever I feel like I need an extra boost of moisture, I go for the Hydra-Cool Serum. It works to rejuvenate and hydrate, and feels super refreshing on the skin. I love it post-flight when my skin feels super dehydrated from all that recycled air. You can even mix a bit with your foundation or tinted moisturizer to give you that perfect dewy glow! Safe to say I’m sold on iS Clinical products, and I highly recommend you check them out for yourself as well!